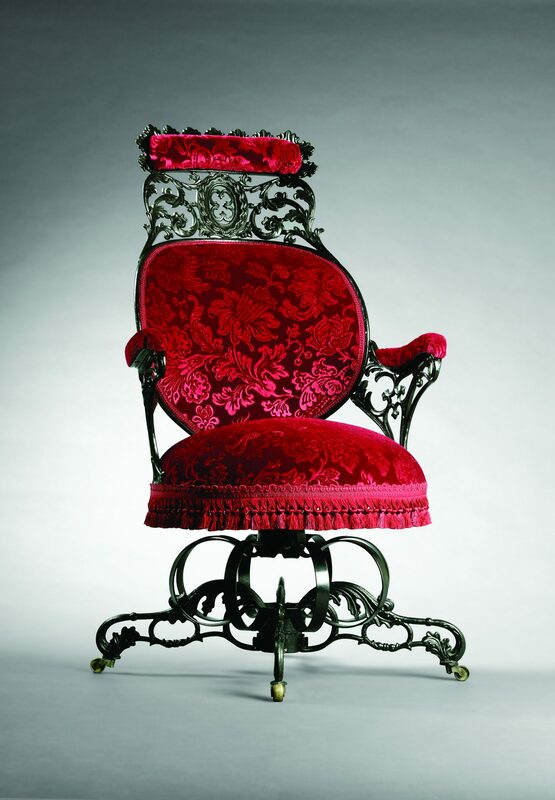 DOYLESTOWN, PA – Beginning February 9, 2019, the James A. Michener Art Museum will present The Art of Seating: Two Hundred Years of American Design, a major exhibition showcasing a comprehensive private collection of iconic and historic chairs reaching from the 1800s to today’s Studio Movement. Developed by the Museum of Contemporary Art Jacksonville and organized for tour by International Arts & Artists, Washington, D.C, these works of art have compelling stories to tell about our national history, the evolution of American design, and incredible artistry and craftsmanship. The exhibition will be on view through May 5, 2019. Most chairs encountered throughout the day define themselves fairly simply—a place at the family table, a comfortable spot with a great view, a seat of corporate power. When looking at the more than 40 chairs selected for The Art of Seating: Two Hundred Years of American Design, however, there is much more to see than simple pieces of furniture. The Art of Seating provides audiences with a unique opportunity to see chair types that usually reside in private homes, withheld from public display. Organized by Ben Thompson, curator at the Museum of Contemporary Art Jacksonville, The Art of Seating takes the viewer into the design studio through patent drawings, documented upholstery, artist renderings, and multimedia presentations. Selections from the Jacobsen Collection of American Art offer a stylistic journey in furniture with showstoppers by John Henry Belter, George Hunzinger, the Herter Brothers, the Stickley Brothers, Frank Lloyd Wright, Charles and Ray Eames, Eero Saarinen, Isamu Noguchi, Frank Gehry, and others waiting to be discovered. The exhibition also features contemporary and historic designs produced by such manufacturers as Knoll, Herman Miller, and Steelcase. Also on view from March 2 – June 9, 2019 is Nakashima Looks: Studio Furniture at the Michener, guest curated by Mira Nakashima-Yarnall, daughter of internationally renowned woodworker George Nakashima and president of George Nakashima Woodworkers, SA. Rooted in the museum’s deep commitment to George Nakashima’s legacy, the Michener has continued to collect and exhibit modern and contemporary craft, including fine examples of Mira Nakashima’s own work alongside those of her father. Nakashima Looks highlights the Michener’s long-standing focus on Studio Furniture, while providing a window to the museum’s future direction. The Art of Seating: Two Hundred Years of American Design is generously supported by Visit Bucks County and Tom and Alycia Scannapieco. Additional support is provided by Barbara Donnelly Bentivoglio and Dr. Lamberto Bentivoglio, EwingCole, and Jane M. Yeuroukis, Inc., Interior Designs. The Art of Seating is organized by the Museum of Contemporary Art, Jacksonville, in collaboration with the Thomas H. and Diane DeMell Jacobsen Ph.D. Foundation and is toured by International Arts & Artists, Washington, D.C.
Exhibition and programming-related information can be found at MichenerArtMuseum.org. The Museum of Contemporary Art, Jacksonville, a private non-profit visual arts educational institution and cultural resource of the University of North Florida, serves the community and its visitors through exhibitions, collections, educational programs and publications designed to enhance an understanding and appreciation of modern and contemporary art with particular emphasis on works created from 1960 to the present. The American Chair Collection started as a way to provide further context to the Jacobsen Collection of American Art—paintings, sculpture, silver and furniture which were acquired during the early 1990s. With the help of Andrew Van Styn, Director of Acquisitions, Conservation and Photography, the creation of the chair collection began with the purchase of an Egyptian Revival Side Chair and has since blossomed to the more than 40 works on display in this exhibition.